Spray tans are one of those beauty treatments that don’t feel necessary until you get your first one. I have really fair skin, and save for a few trips to the tanning bed in high school (I know, shame), I have stayed away from the sun. But that doesn’t mean I don’t think a bronzey glow suits me. Enter spray tans. During my first treatment, I was nervous I’d look more like an Oompa Loompa than a sun-kissed goddess. I told the technician I wanted it to look as natural as possible and hoped for the best. What happened when I left was a miracle. Sure, you look a little greasy in the minutes after exiting the salon. But give it eight hours and a quick shower and you’ll be glistening. Truly, I looked like I had just gotten back from a quick jaunt to some secluded island. The trick is in the formula, especially with pale girls. Even after years of faux-glow appointments, I still recently managed to make the cardinal mistake when I went in for a quick spritz. First, I forgot to remove remnants of an old spray tan beforehand. According to the Pink Sands website, this is the worst thing you can do. My tan was patchy, flaky, and super dark in weird places. The salon suggests, “The best way is to soak in a tub with sea salt and essential oils. Slough off the color as gently as possible. The following day, use a non-abrasive exfoliant.” Evans agrees: “For small areas, use a hair-removal cream like Veet Gel Hair Remover Cream ($8). Apply with a Q-tip precisely onto the areas. For sensitive skin or for your face, cleanse first, lightly exfoliate with a facial scrub, then apply an astringent toner or lemon juice with a cotton ball and sweep over dark areas of self-tanner. Also, chlorine will remove self-tanner so you can always try taking a dip!” She adds, “For the tan to develop, the self-tanning agent known as DHA has a natural chemical reaction with the protein (amino acid) and oxygen on the skin’s surface. If the skin’s pH balance is high, this can result in an unnatural, orange tan. Which brings me to my second devastating mistake. I moisturized before the tan, but I applied the wrong product. Evans suggests, “Use a basic body moisturizer which is free of mineral oils. Oil can leave residue on the skin and interfere with the self-tan development. Cocoa butter or an aloe vera-based moisturizers work wonderfully.” Additionally, it matters where you apply your moisturizer. Evans says, “Before your appointment, make sure hands, feet, elbows, knees, and any other problem areas are well moisturized. Picture it like this: Your tan is to watercolor paint what moisturizer is to water—so you’re blending and fading to perfection. Now, before every appointment, I reach for an oldie but a goodie: Queen Helene’s Cocoa Butter Hand and Body Lotion ($3). Now, what about after the tan? I’ve used so many products that seem to leave my body looking streaky after the fact. And since a bit of the tan washes off with each shower, I find myself showering less than I should be (no, it’s not exactly the most cleanly quality, but it’s true). After chatting with Evans, I’ve had great success with Mario Badescu’s Summer Shine Body Lotion ($10) as it’s enriched with vitamin A, beeswax, and peanut oil. 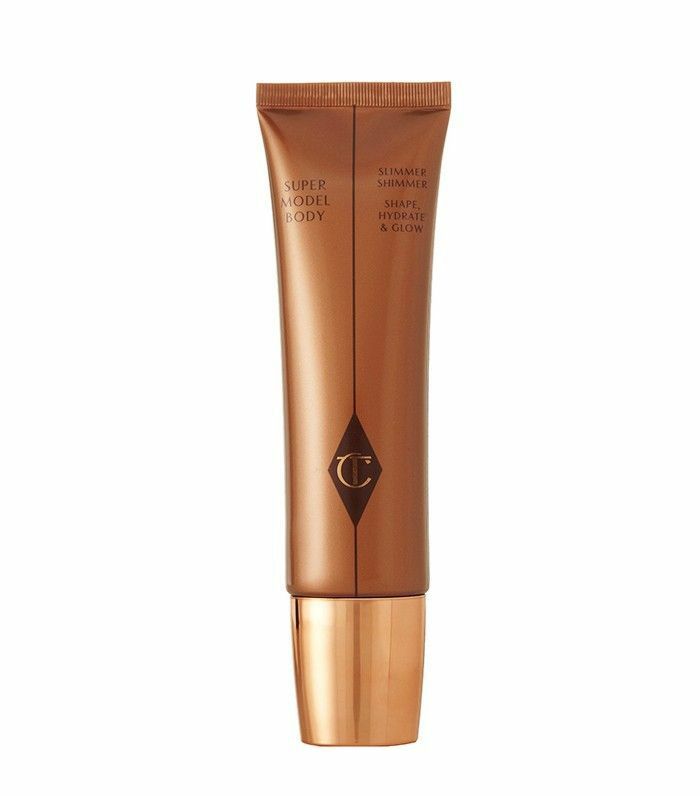 It shimmers, so it adds even more glow to your limbs and keeps your tan going strong. Plus, it absorbs quickly and won’t leave you greasy in the summer heat. 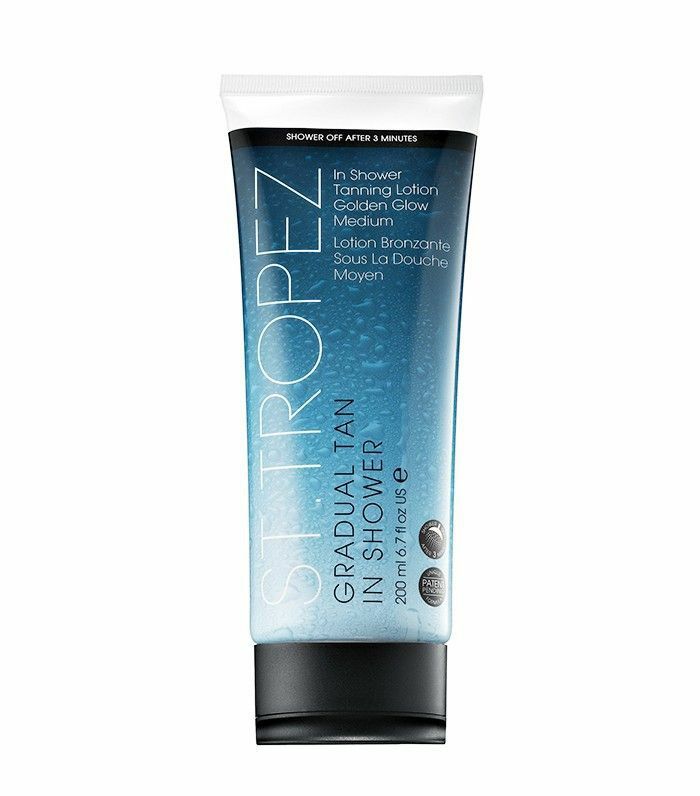 For the times when I do have to shower, I’ve become obsessed with St. Tropez Tanning Essentials In Shower Gradual Tan in Medium ($25). It’s a natural-looking, gradual self-tanner that you can apply in the shower. All you have to do is smooth it onto wet skin, let it sit for three minutes, and wash it off. It maintains the color that the water would otherwise wash off. Keep reading for a few more favorites that will extend the life of your tan (and keep you moisturized for your next one). 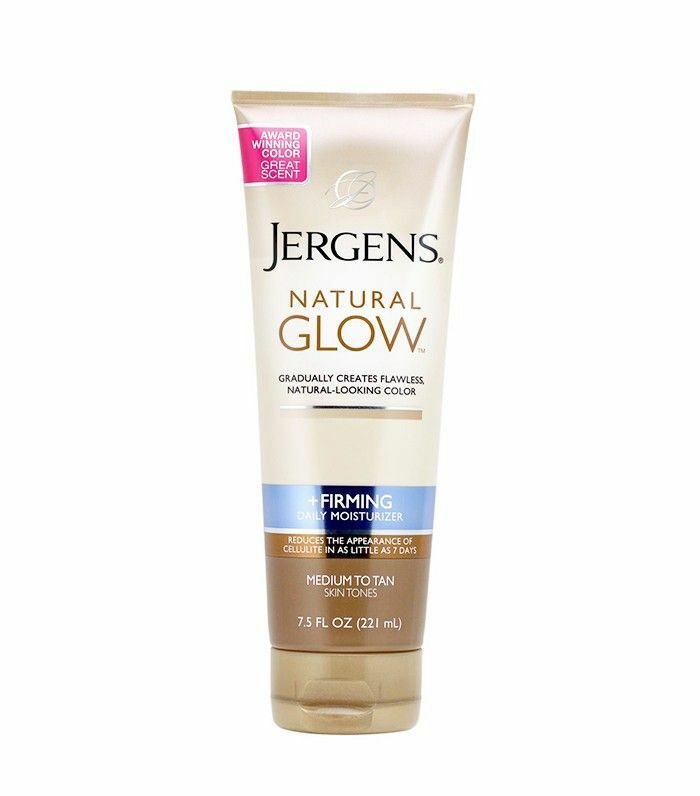 Keep your tan intact (without pulling at your purse strings) with Jergen’s daily moisturizer that gives you a natural allover glow over the course of a few days. The gradual formula makes it so you’re never streaky and always happy with the results. 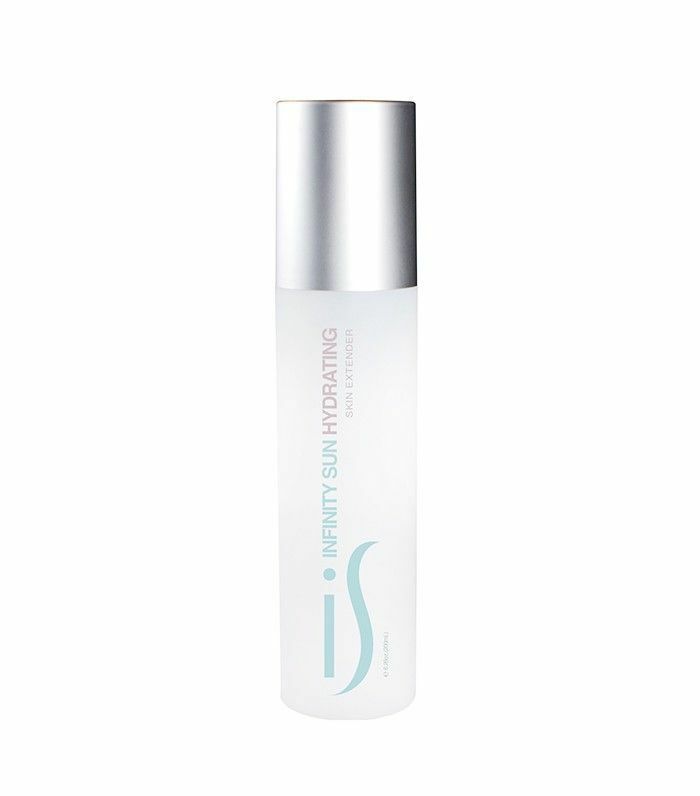 Try this super-hydrating serum chock-full of antioxidants, botanicals, and DHA, designed to keep your skin soft and extend your tan for an additional two to three days. Not only does this product add shimmer and radiance to your bod, but it also has a slimming agent. Coined “shapewear lingerie for the skin,” the potent mix of caffeine (to tighten), aloe (to soothe), and highlighting agents (to flatter) creates the illusion of longer, leaner limbs that glow on top of an airbrush tan. Looking for more products to try? Meet the new generation of sunless tanners.